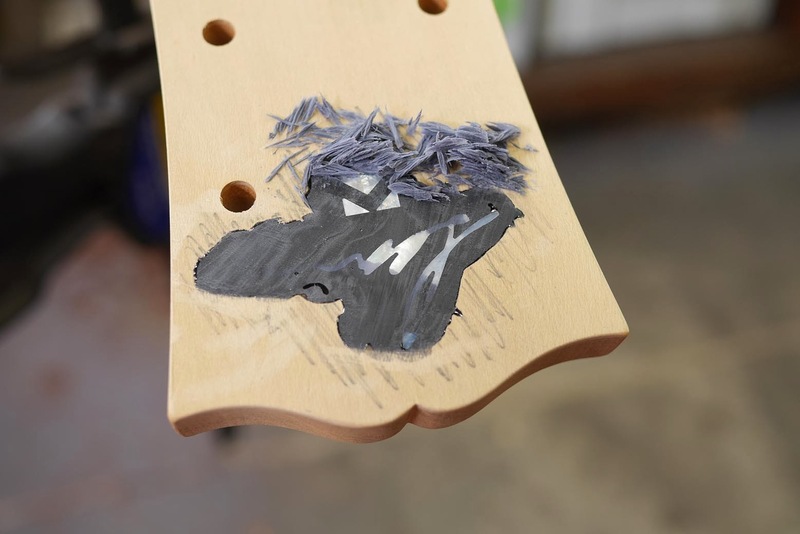 Once the fingerboards were done, it was time to switch to the bodies. For some odd reason, I did not take any images up to this stage. 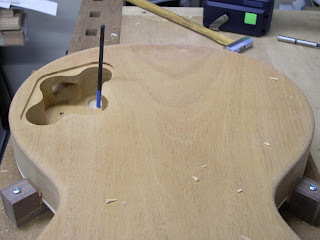 There is a chanel that is routed into the Mahogany to allow for the wiring. 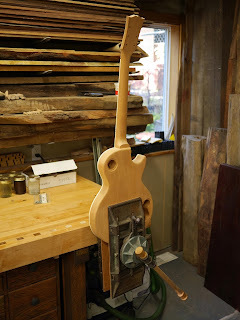 This is done before the maple tops are glued on. I have a bit of a confession to make as well - I did not hand carve the tops. 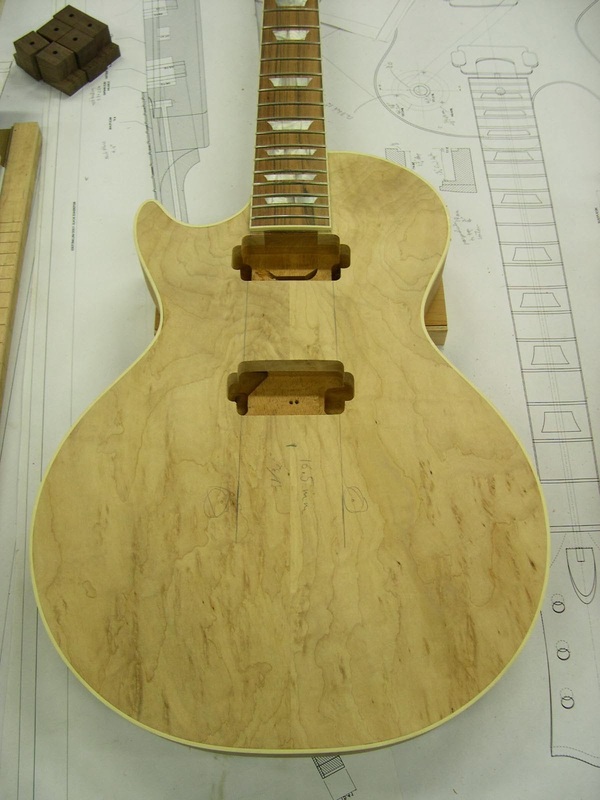 They were done using CNC, referencing the contours of a couple of original guitars and then averaged out. 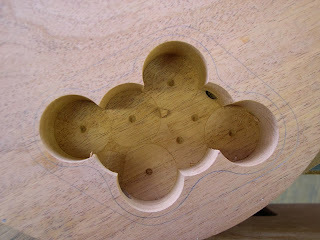 When I make another one - I will carve the top myself, just for the experience of doing it. 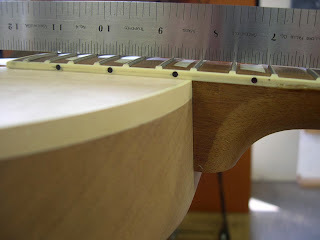 The body binding was an interesting adventure. 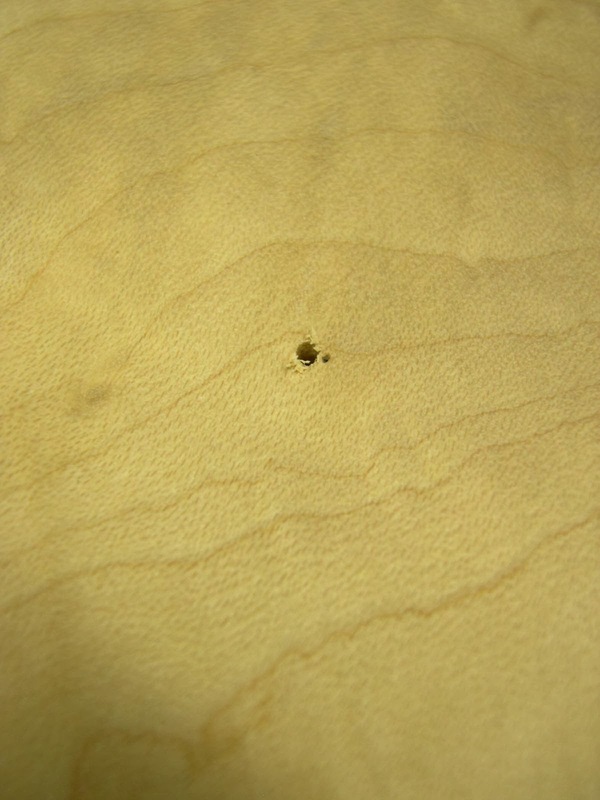 It is a plastic binding and is heated using a heat gun to soften it to conform to the contour of the body. There is a fine line between not enough heat making the binding too stiff, or too hot, turning it into an overcooked spaggetti noodle. 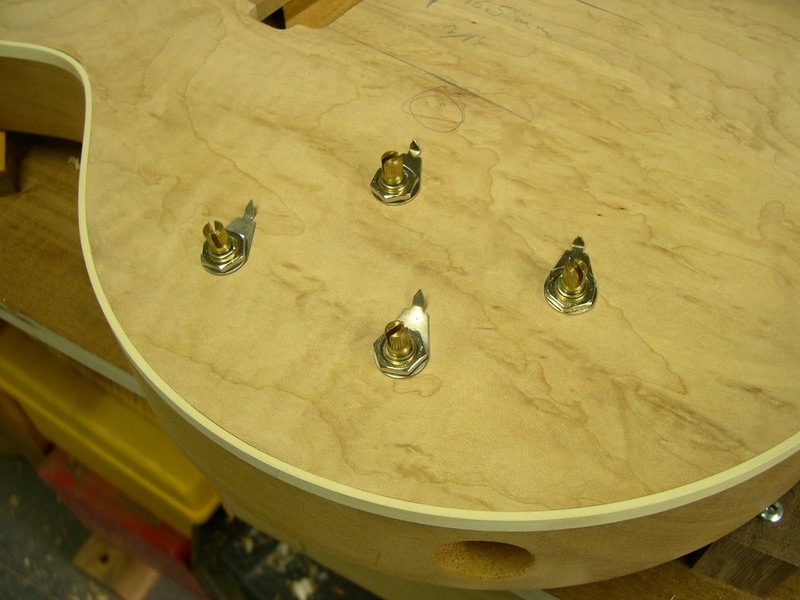 The hardest part was around the cutout and Tom’s skill in this area was a huge help. Once the body binding was on, it was time to scrape it flush with the top, being careful not to scratch the contoured maple top.This was done with a thick card scraper and was easier than I thought it would be. 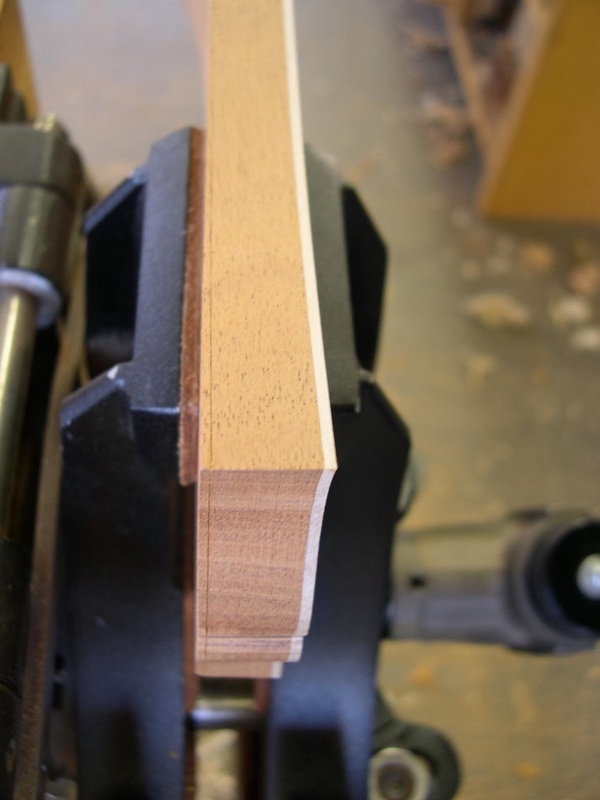 You can see long wood like shavings hanging off the edge. 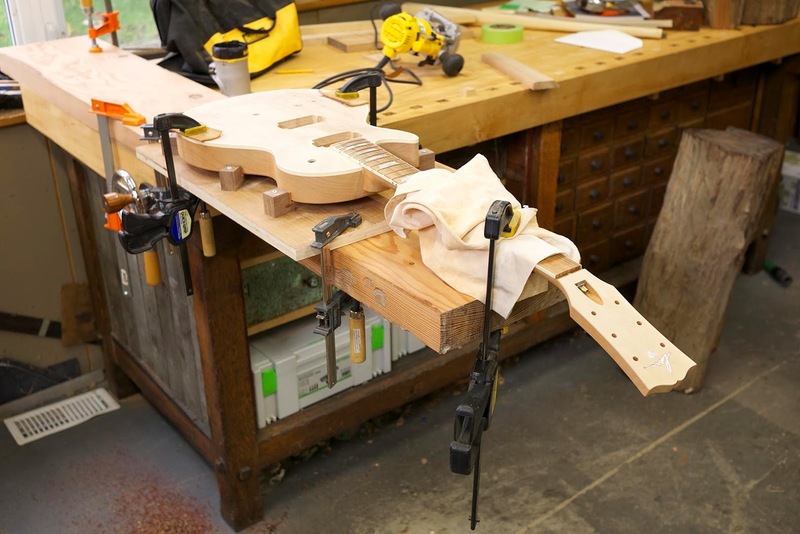 The neck is mortised into the body of the guitar and there are some tricks to doing this. 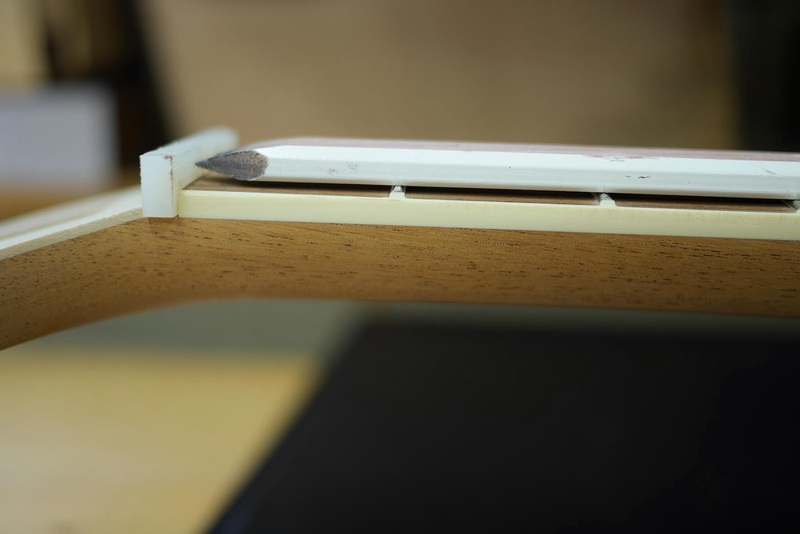 Tom identified a location on the body where the height of the fretboard needs to be 16.5mm high when extended with a straight edge resting on the tops of the frets. You can see the set-up above and the next 2 images are close-ups of that same set-up. 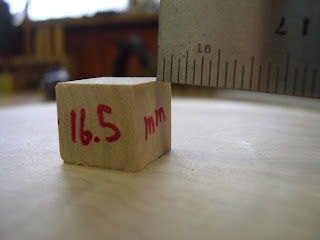 I made a 16.5mm block to keep things easy to keep track of. 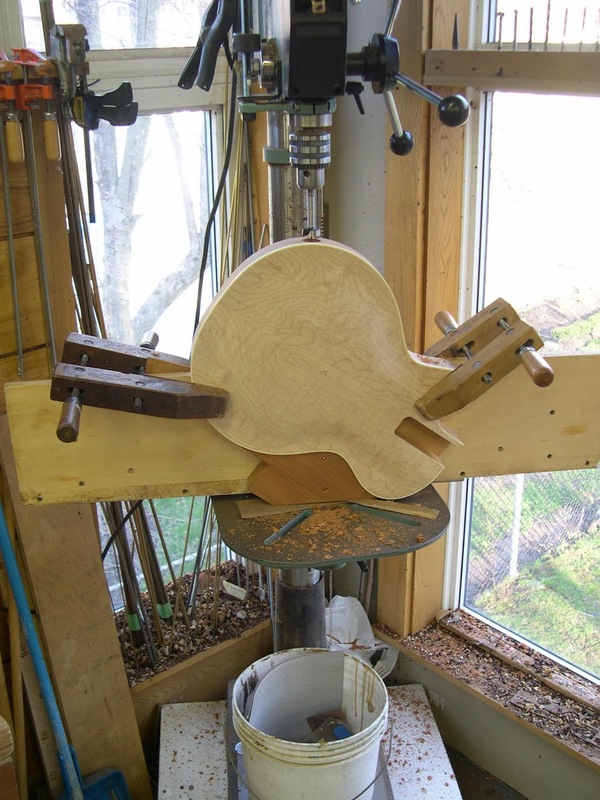 It was a delicate balance of adjusting the maple top so the underside of the fingerboard was flush, while keeping the bottom of the neck seated properly in the mortise. 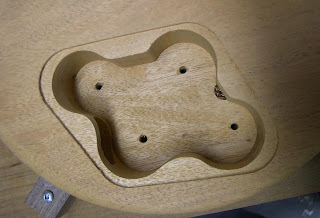 Ideally, they should both mate perfectly with those surfaces. There were a few adjustments to the angled shoulder on the neck so it was flush with the end of the body. 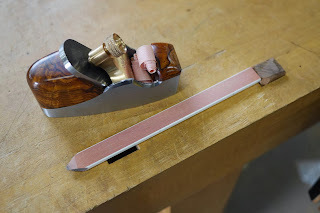 It was careful work but felt somewhat familiar to plane making - and I was thankful for the extra wiggle room Mahogany offers when compared to 01 tool steel. 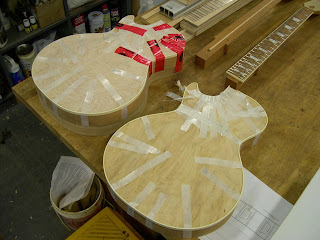 The 2 fit necks - these are finally starting to look like guitars! The next step was to drill the holes for the tuners, the plug, control and switch cavites. I made a quick jig to hold the guitar body in a parallel position to the back. 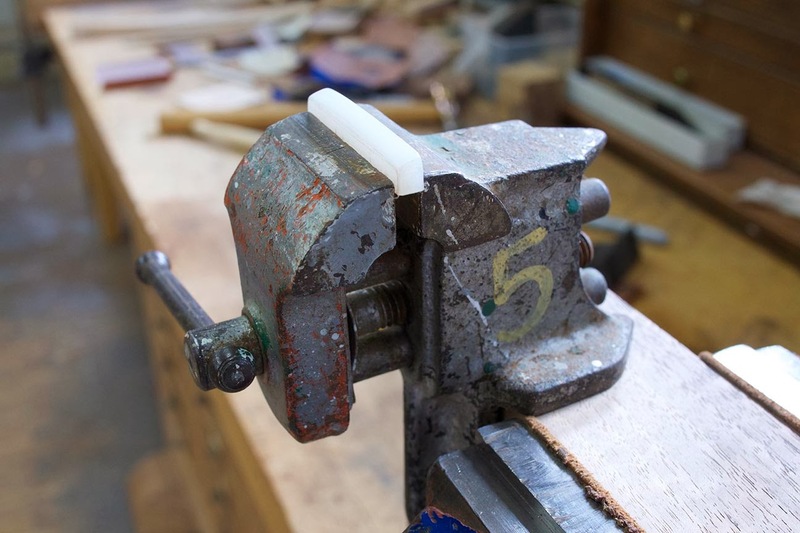 Pretty simple - walnut blocks with leather to keep things held firmly and somewhat cushioned. 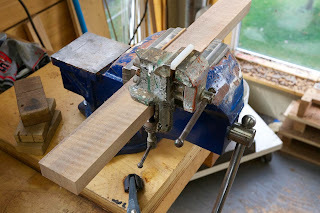 Wasting out some bulk of the control cavity on the drillpress. 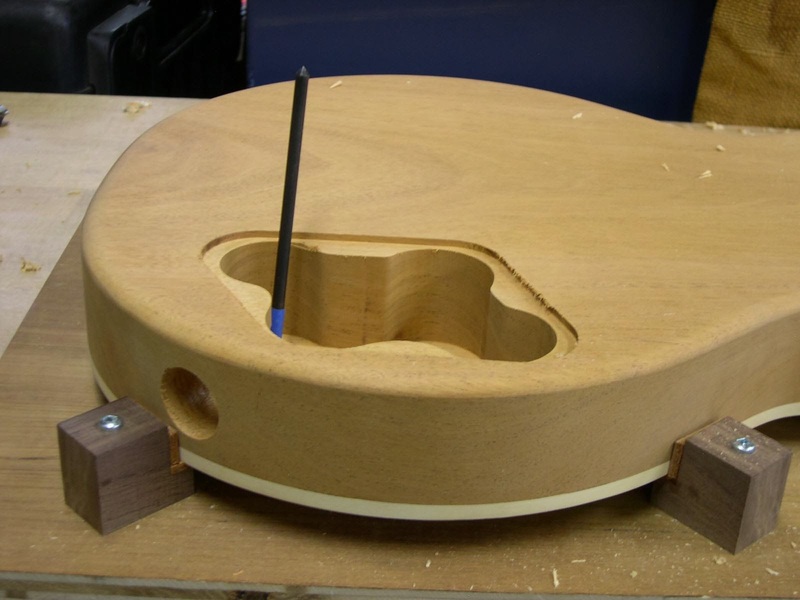 Wasting out most of the control cavity was worth the effort - plus I don’t really like routers and this greatly reduced the amount of routing time. 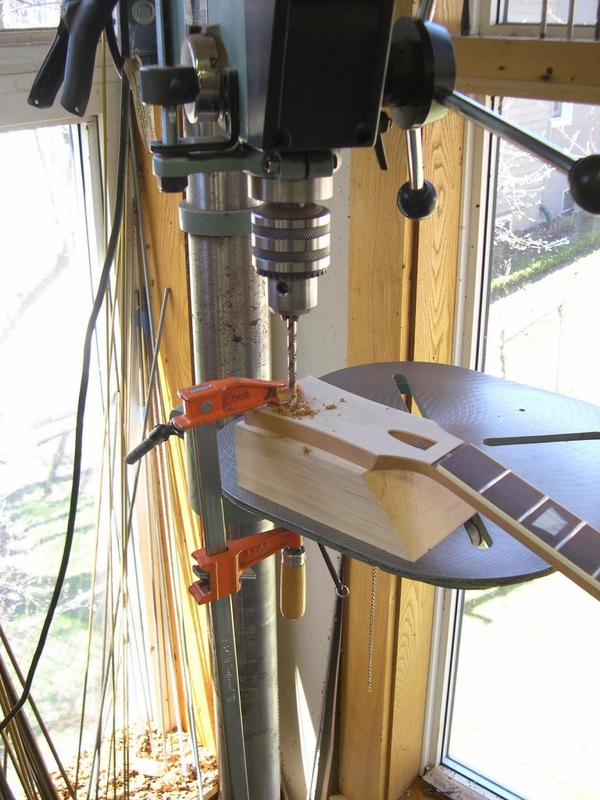 Drilling for the plug. I have gotten in the habit of keeping all the offcuts from projects and this is a good example of why. 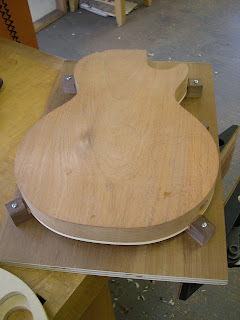 The offcut from the body cutout was the perfect jig for positioning the guitar at the correct angle. You can see the piece of Mahogany at the waist of the body. Doing the final planing on the Holly headstock veneer. Drilling the holes for the tuners. 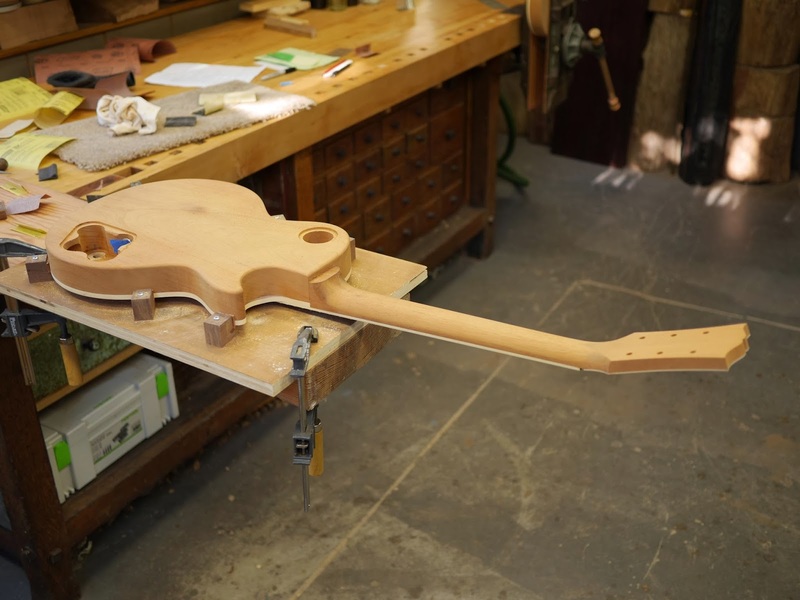 One of the curious aspects of making these guitars was learning some of the processes luthiers use - and not just Tom’s processes. 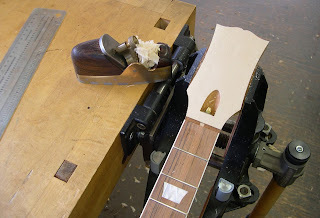 Once the holes are drilled for the tuners, it was time to taper the headstock to the correct thickness. The headstock is 16mm at the neck end and tapers to 14.5mm at the tip. I had asked several luthiers how they do this and most of them answered with some form of fixture and power sanding. 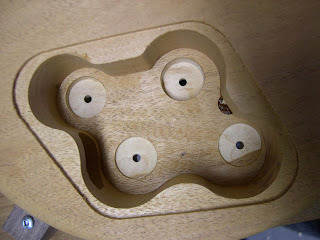 This struck me as a little odd so I did it my own way. 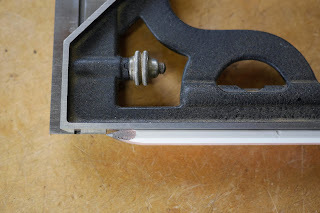 ... and planed to the line. 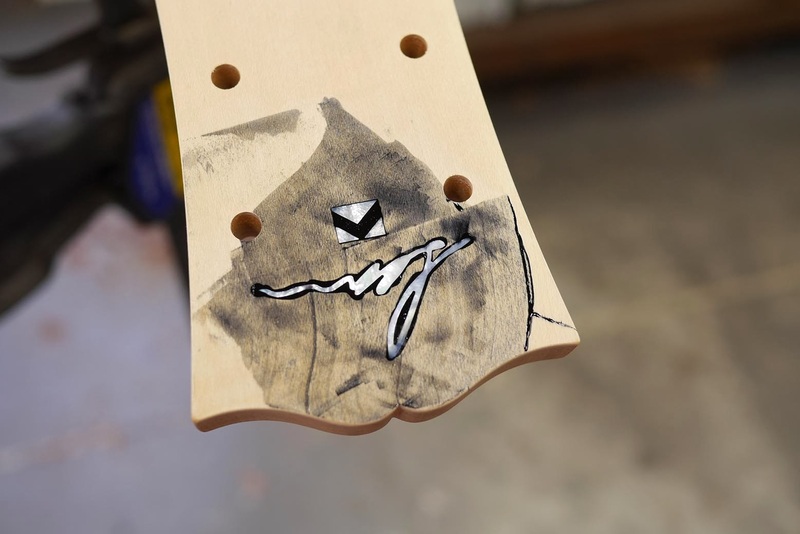 It was about 4 minutes of work and struck me as a much faster and more accurate way of working not to mention way less messy. I went to Tom’s place to route the cavities for the pick-ups. 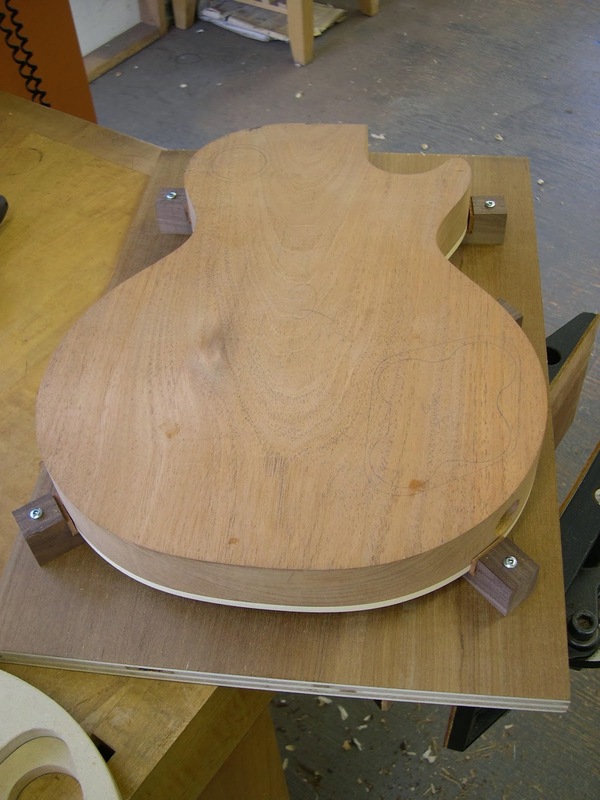 I have a set of templates to do this, but he is set-up for it and was generous enough to let me use his tools. Once the pick-up cavities were done, it was time to finish off the control cavity and switch cavity. I used a very small 1/6" bit to drill a pilot and location hole for the controls and switch. I had marked the locations on the top as well and used the pilot hole as a cross-check. The above image shows how close they lined up - everything was working out wonderfully - which is good, because things were about to get really tricky. 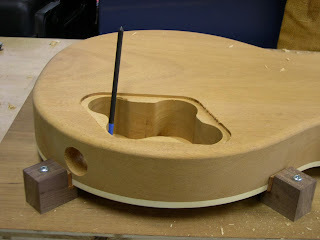 The holes for the controls need to be angled to match the contour of the top. 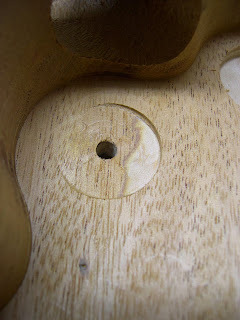 I used a punch in the holes to check the angles. With the angles established, it was time to use another bit to create the angled recess for the bottom of the pots to rest on. 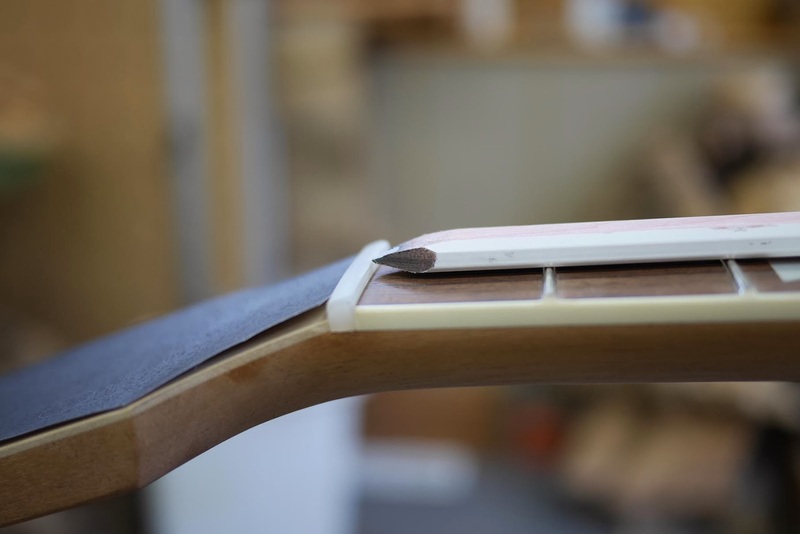 These are angled to be as close to parallel to the contoured top as possible. Each recess is slightly different. 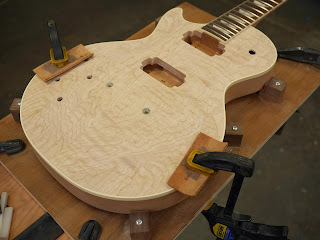 They also needed to be chiseled out to allow for the tabs and wires to not interfere with the fit. 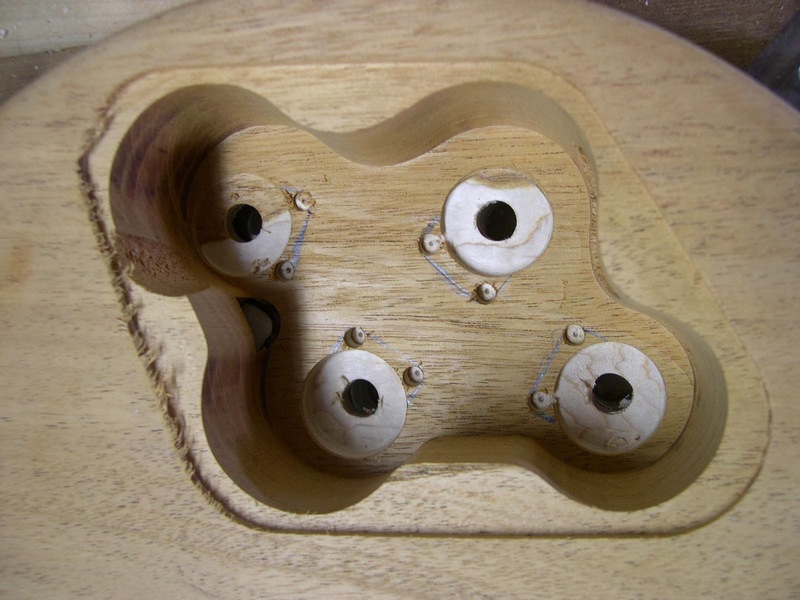 The pots need to register solidly on the underside of the control cavity. The controls and tabs in place. Phew! As the months wore on, there was one aspect to the guitars that I was avoiding - dreading to be honest. 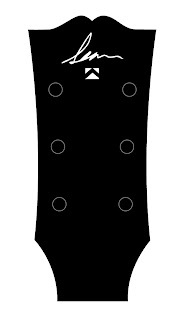 The headstock logo. 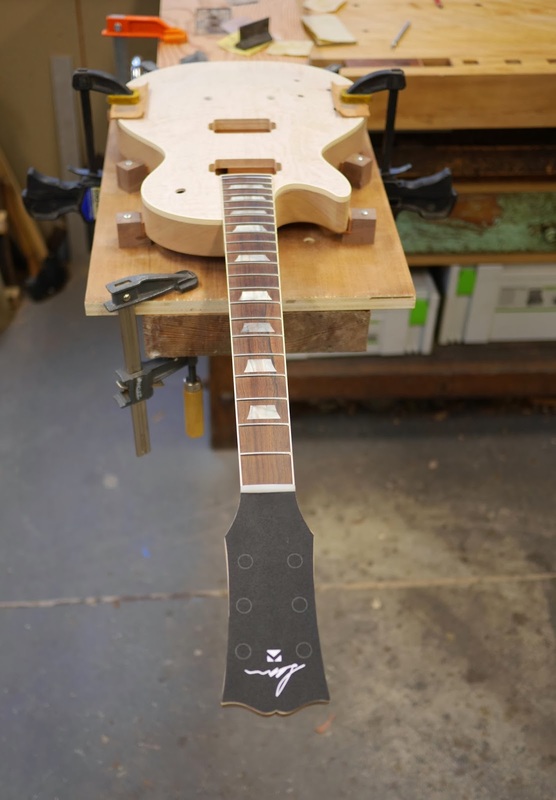 I did not want to use the Gibson logo. 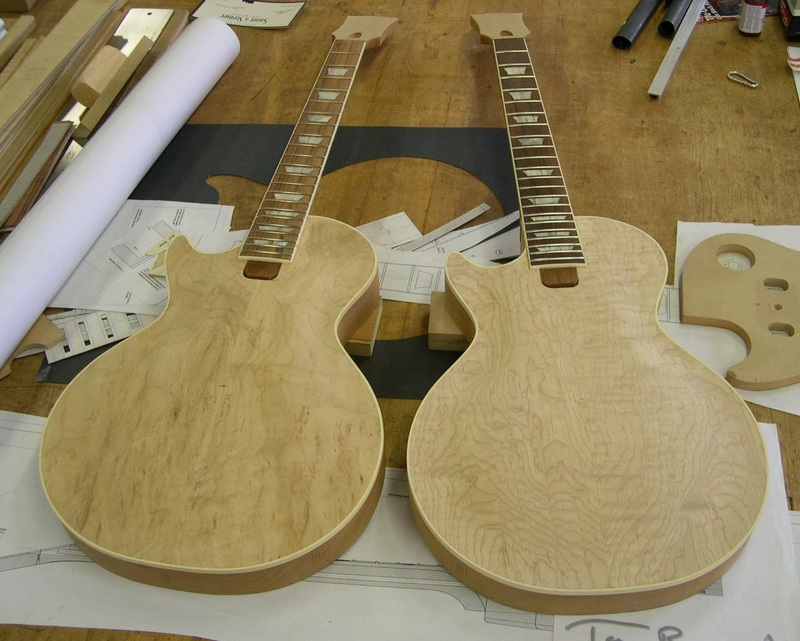 While these are clearly based on a Gibson guitar, they are not made by Gibson. Which left me to come up with something. I know I spent a shocking amount of time thinking about it - over thinking it, stressing about it and general analysis paralysis. 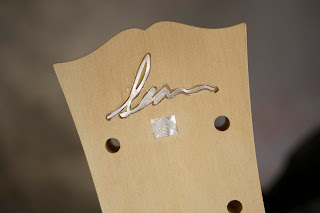 In the end, I did not deviate too much from tradition - a stylized signature and a small logo mark. 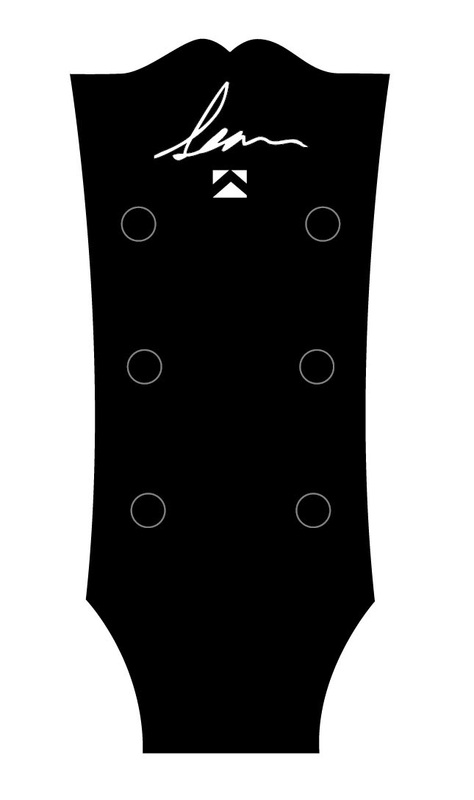 I did however have fun with the fact that these are leftys. Here is where I ended up. 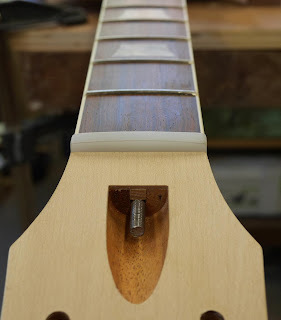 The mocked up headstock. This was a big relief to get this resolved and I could finally move to the final sanding stages. 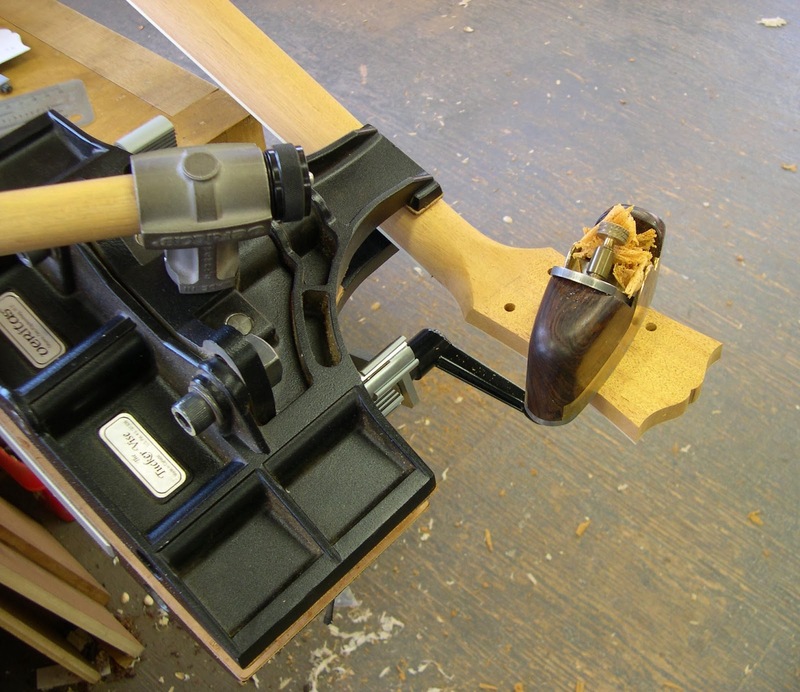 There is rarely a week that goes by where I am not thankful for my Emmert patternmakers vise. With the bodies and neck sanded, it was time to fit and shape the nut (the piece at the end of the fingerboard that holds the strings to the correct height). Tom showed me a slick way to mark the nut - plane a flat side on a pencil until the tip is at the desired height. Place the pencil on the frets and mark the height. Shaping the nut was done in a very small vise mounted to a piece of walnut (an offcut from our dining room table) and mounted in one of my planemaking vises. 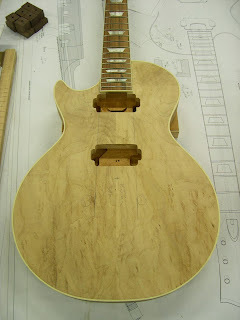 And a few shots of the mostly finished nut. There will be some further fine tuning during set-up. 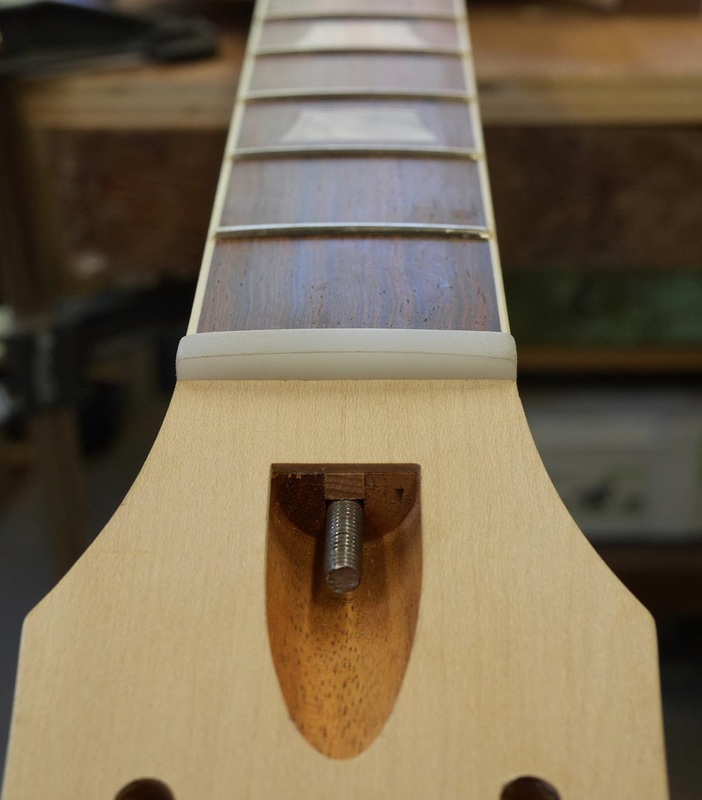 Time to route the cavity for the headstock inlay. I secured the guitar and used my small router with the same 1/32" bit. It worked really well. I placed a drop of CA glue to hold the logo in place and then mixed up some 5 minute epoxy and added a drop of black dye (the same black dye that is used to paint the headstock in the finishing stage). 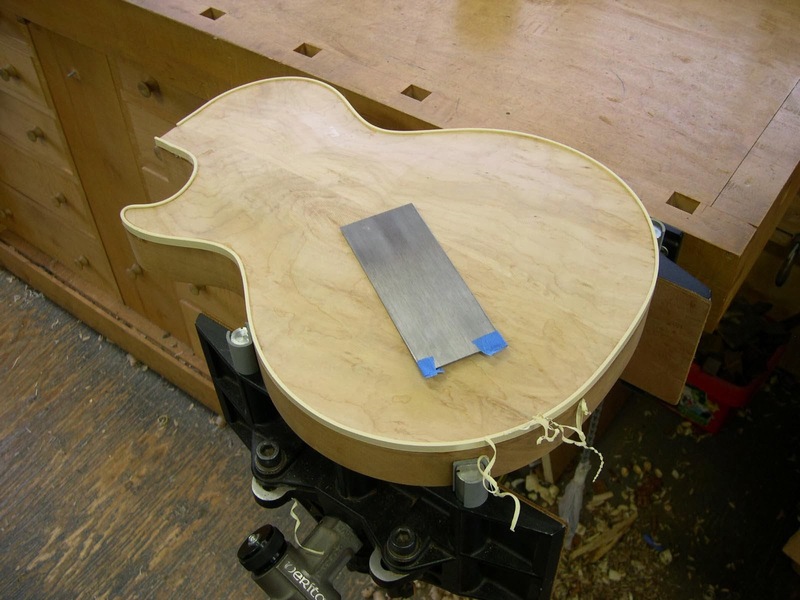 Once it was dry, I scraped it flush using the same carbide scraper that Riley used for the cuttingboards. 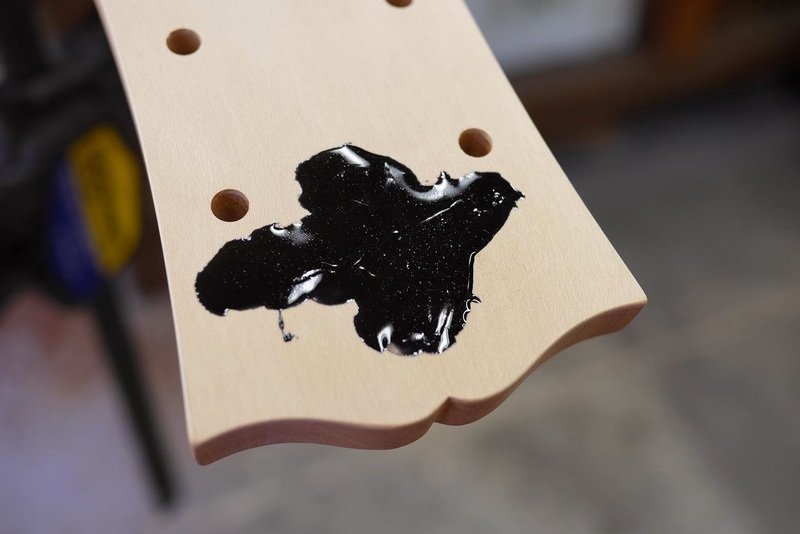 There are usually a few pin holes caused by air bubbles, so a second coat squeegeed on is used to fill those. Once that is dry, re-scrape and do a final sanding. 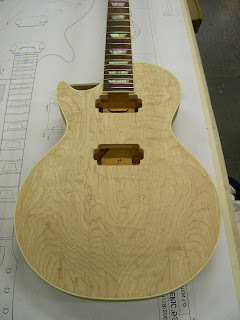 In hindsight - I should have just used a piece of quarter sawn Ebony for the headstock instead of Holly. 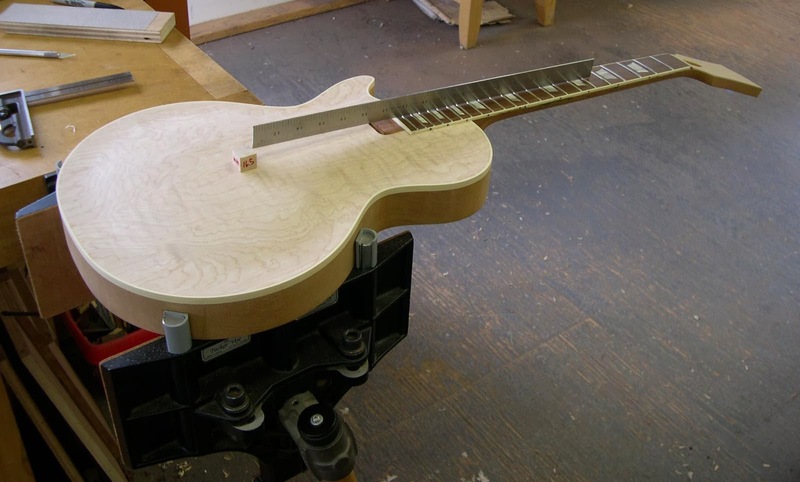 Holly was the traditional material for original 59’s, but Ebony would have been way easier. 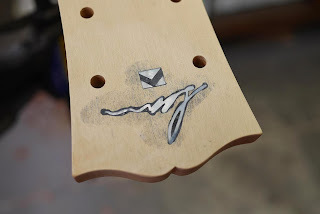 With the headstock logo completed as well as all the final sanding - time for finishing! 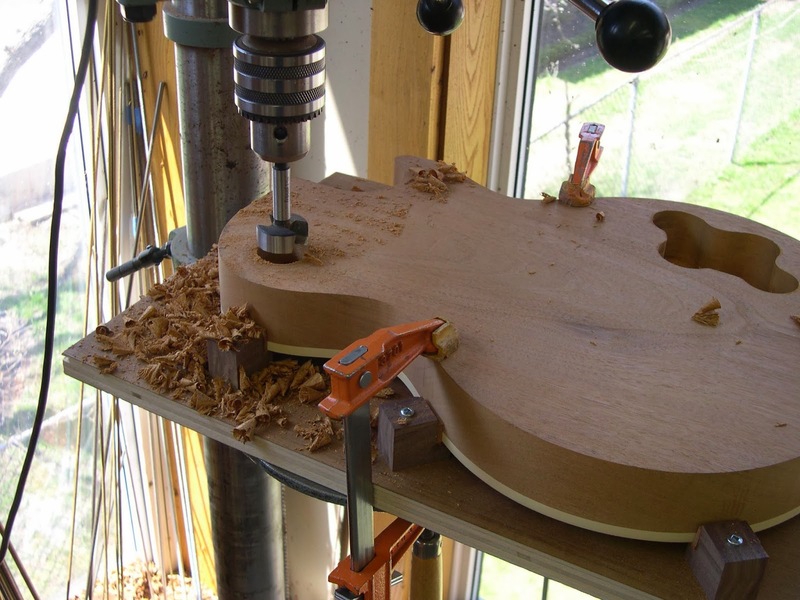 Konrad, as usual its excellent work!. The inner kid is at play, pretty much most of the time, I would say. 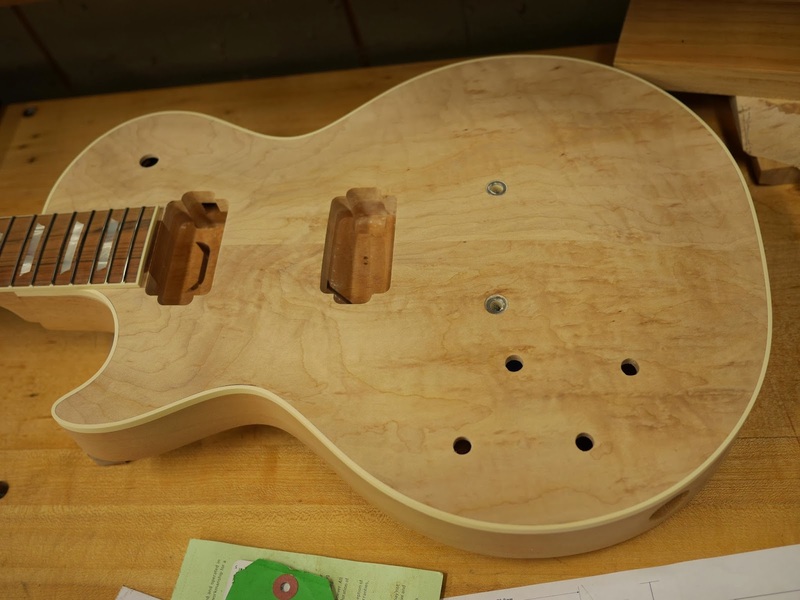 Really exceptional work as usual… The planes, the floor, the dining room set, the guitar… What's next? Keep up the great Work, really inspiring! You're right about the headstock tapering technique. 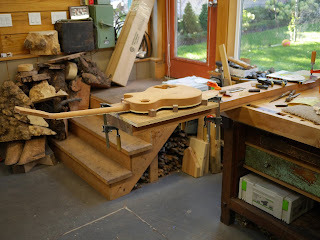 Guitar makers are all about power tools, jigs and sanding; that's what drove me out of it! JT - the inner kid is alive and well and plays more often than not. A pretty lucky kid really. What is next will show up in a few months. Think 600lb piece of wood. Thanks Al - nice to see your name in the comments list. I trust you and your family are all doing well. Nice to hear from you. The world has lost something if you are not making instruments anymore - I hope you are only talking about guitars and not the other instruments you make! Toby Sauer - too cool to have another Sauer in the mix! 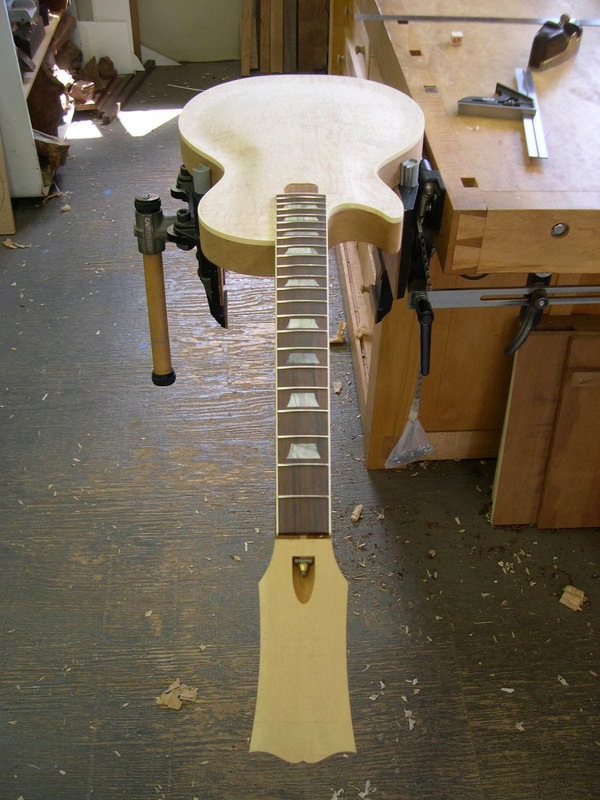 This particular guitar is not an inexpensive adventure. 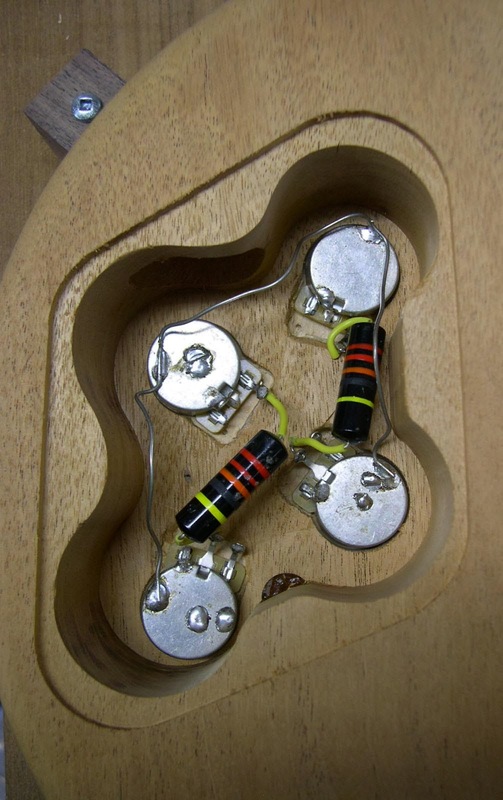 The wood components are one thing - the electronics are yet another. You could be into $1,000. Pretty fast and it would be easy to cross into $1,500+ range. That being said, you could make a much simpler guitar without the carved top, no sunburst pattern and a bolted on neck. I say go for it - I hope to repeat this process with one of our boys at some point. Riley is looking to make himself a new bed - he is in the one that I spent my childhood years in as did my dad. I guess 3 generations is pretty good. 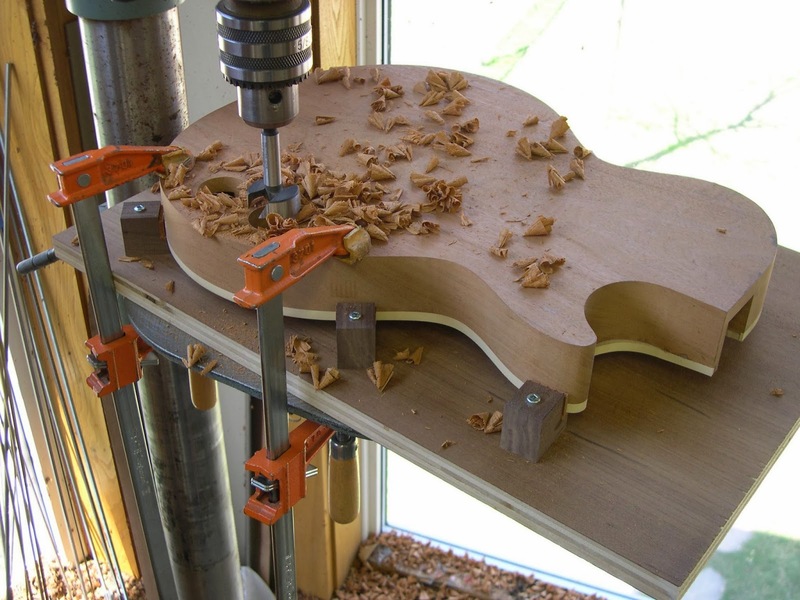 Don't worry, I'm still deeply into viol and violin making, where there's much more room for hand tools! 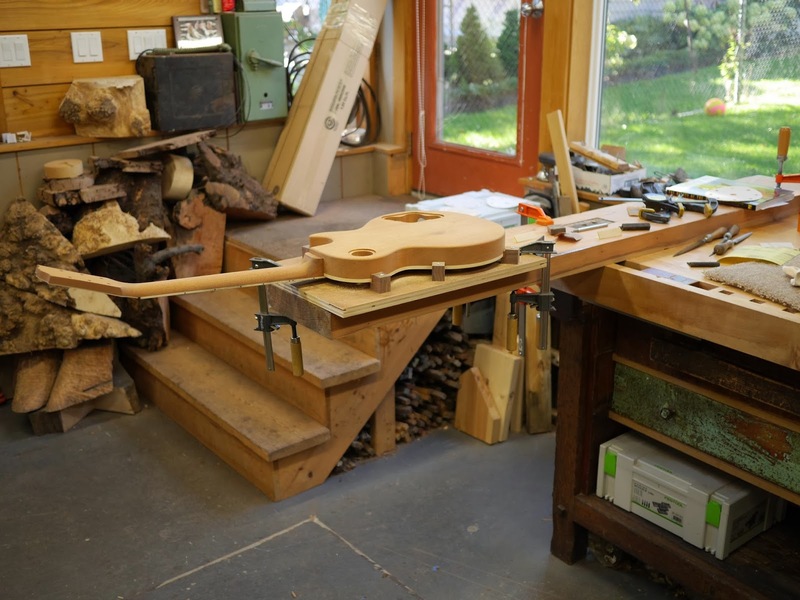 Will you come to the Lie-Nielsen event in Montreal this year? I'll have a guest room for you if you need.